Judy Watson has described her experiences of travelling to her great-grandmother's country in north-west Queensland, as 'learning from the ground up'. It is a philosophy she has transplanted on her several journeys and residencies abroad. In 1997 she represented Australia at the Venice Biennale, along with Emily Kame Kngwarreye and Yvonne Koolmatrie. Watson's matrilineal link to the country of her ancestors has always been central to her printmaking and painting. The hidden histories of Indigenous experience on the colonial frontier – particularly those of women – continue to inspire her. Watson seeks the indelible impressions of past presence on the landscape rubbings, engravings and incisions – and subtly inscribes them upon her work. Often using natural materials found in situ, she colours the canvas while it is laid wet on the ground, allowing the earth's contours to form a blueprint for the pigments pooling upon it. Forms of humans or natural features, as in 'saltpan', 1992, emerge from within. Watson does not frame her paintings, preferring to hang them so that they appear to float off the wall, or even spill onto the floor, their organic shapes suggesting a flayed hide. remembered being told that the old people used to be able to tell where a person was from by touching their hair. 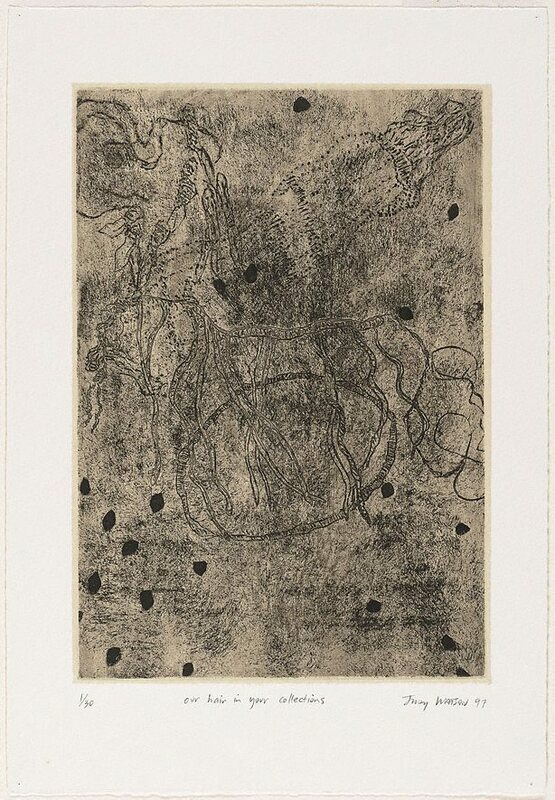 In a process the artist describes as 'translation', Watson created the etchings from her drawings, yet was careful not to exactly replicate the objects and even concealed them behind a veil of chine collé. In so doing, she respectfully acknowledged their cultural significance, while enfolding these disenfranchised objects in a protective 'skin'. Signed and dated l.r., pencil "JUDY WATSON 97".